News Portal is a medium for online communication through the internet which connects people around the world. It is basically the electronic version of a newspaper which you can find by browsing through the internet. News portal development includes the publishing of articles, blogs, press contents, editorial columns and many more. It also includes uploading of photos, videos, etc. with the help of media management tools. You can read the contents live or download it for future reading purpose. News portals offer you contents from various segments such as lifestyle, entertainments, jobs, politics, education etc. You can stay updated with the current social and environmental status of the world by reading the web contents of the news portal. To avail premium news portal development services at a pocket-friendly price, you can connect with our team of experts. We at UAE Technician have a bunch of skilled experts who can guide you to design an exclusive new portal with rich contents. Call us, email us or chat with us to avail our class apart services at a cost-effective rate. We at UAE Technician help to design ePaper, eMagazine, ePortal, eArchive and many more. 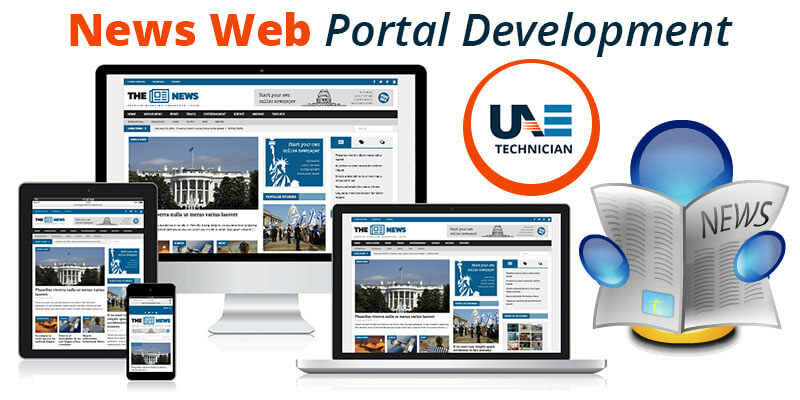 Apart from designing news portal, we also design enterprise portal development and personal portal development. Take a look at various services you can avail by connecting with us. We have a team consisting of a bunch of experts who have years of experience in designing news portals. They can assist you in the best manner to develop an exclusive news portal for you at a reasonable price. They undergo rigorous training at regular interval which helps to enrich their technical knowledge. Furthermore, we collect regular feedback from our customers which helps to improve our service quality. Our charges are nominal and we always charge for the amount of work done by us. Avail the cheapest news portal website development in Dubai by connecting with us. What are the benefits of developing a news portal? It offers information to the public regarding political, social, sports, entertainment etc. In addition, you can give your comments or feedback on any issue. Grab the golden opportunity of availing the right service at the right time by connecting with our experts at UAE Technician. If you are looking for cost-effective news portal website development in Dubai, call us immediately at our helpline number:042053349 . You can drop an email to us during busy working hours and receive a call back within the next 24 hours. In addition, you can connect with us via our live chat window and avail instant response. We also provide Education portal development service in Dubai.